This book lived up to so many expectations, and I enjoyed it so much. Even though the "A Song of Ice and Fire" books are very long, they keep you gripped from start to finish, and there were so many plot twists in there to keep me interested. The characters were just as brilliant as ever, although there was so no Dani or Jon (their story is told in the next book), and I loved how different each character was compared to the other. The characters had all developed since the previous book, so more than others, and it was obvious how some events had affected different characters in different ways. The settings, as always, were amazing - I especially loved the portrayal of Braavos and of the Eyrie in winter. 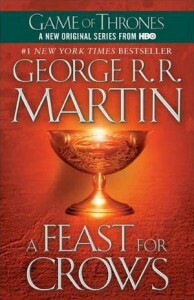 A Feast for Crows is a great addition to the series.